This album contains songs which are not only about problematic love but contain a universe of feelings. 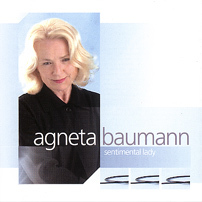 If anyone stops for a moment to consider who in Sweden is capable of moving her audience to deep emotion, touching their hearts with bittersweet sentiments of life, then Agneta Baumann's name must be one of the first that springs to mind, with the husky intimacy of her voice spreading gentle vibrations particularly when interpreting a jazz ballad. The jazz ballad has long been an ingredient in almost every jazz recital. Even Jazz at the Philharmonic concerts presented by Norman Granz featured a relaxed ballad medley between the driving trumpet duels and hectic drum battles. It gave everyone a chance to cool down and allowed time and space for the accent on beauty. Among jazz ballads there are some which are often derived from minor keys and contain lyrics of a rather sad nature. These are in some cases referred to as "torch songs" which are by definition "sentimental love songs, typically where the singer laments a lost love" - and almost always sung by a woman. It is apparently more natural for a woman to unashamedly release the reservoir of feelings inside her in a myriad of creative ways whereas a man, with much effort of self-control, seeks up his local bartender for company, orders too many drinks and then launches into a saloon ballad like "One For My Baby" in the best Sinatra manner. So, by definition, these kind of songs with sad emotions are seemingly best interpreted by women. The world of opera has had its share of wonderful emotionally expressive women - one of the most renowned being the immortal Maria Callas. One must also remember the enormous emotional strength behind Edith Piaf's chansons. In the world of jazz there have been many outstanding examples of female singers who have communicated great depths of feeling to their audiences and even if one thinks immediately of Billie Holiday there are a great many others who have made recordings of jazz ballads which are historic. This album contains songs which are not only about problematic love but contain a universe of feelings. If anyone stops for a moment to consider who in Sweden is capable of moving her audience to deep emotion, touching their hearts with bitter-sweet sentiments, describing the "blue" aspects of our lives, then Agneta Baumann's name must be one of the very first that springs to mind, with the husky intimacy of her voice spreading gentle vibrations particularly when interpreting a jazz ballad. Capturing a mood of true poignancy is something of which only a few are capable, and in Agneta's case the moods she creates are largely a reflection of her own experiences in which an unfair share of dark clouds have crowded the horizons. In the liner notes of her previous CD "Comes Love" it was described how Agneta's relation to the lyrics of each song is an absolute deciding factor when it comes to her performing them. It feels as though that process has even been taken a step further on this CD because she goes as far as to select individual songs, the words of which she associates with events of a deeply personal nature in her life. Herein lies a torch. It consists of burning and passionately-felt sentiments that cover most of her lifespan up until this day. But there is no attempt to exclude us, the listeners, from this intimate combination of music and emotion. Despite the introvert nature of her songs Agneta is an attractive, humorous, warm and positive human being, seemingly at peace with the world. Speaking for her fellow-musicians on this CD she has only superlatives. This being her third album for Touché Records it will be noticed that pianist Gösta Rundqvist and trumpeter Bosse Broberg who appeared on her second album "Comes Love" are once more on hand to lend their quick-thinking musical reactions to Agneta's turns of phrase. However, this is the first time she has had the pleasure of working with Palle Danielsson, a bass player of the highest echelon internationally, having played with such world stars as Keith Jarrett, Charles Lloyd and Michel Petrucciani, among others. His contributions to this album in terms of tasteful and masterly playing could not have been surpassed. With these, three of the finest Swedish jazz musicians, Agneta was given totally free hands to select the material of her choice. Together with Gösta she discussed what started out as around a hundred different songs. These were then narrowed down to twenty of which the ten on this CD make up the final selection. It is Gösta, with his strong individuality and searching musical mind, who has moulded the pattern of each song into the arrangements which provide Agneta with all the directions needed for her own musical journey. The introductions, choices of tempo, modulations and endings bear the stamp of his sound judgment. From the very beginning of this project Agneta had made it clear that absolute truth and sincerity in the creation of these performances by everyone concerned was more important than perfection, technical prowess or anything meant solely for the sake of impressing. "At this stage in my life I have no alternative than to give everything I can in an expression of total honesty" says Agneta, adding "For my part I want to scale the words and music down to the most basic and direct form, at the same time letting each musician have total freedom to create their own tonal and rhythmical world." One can clearly hear evidence of this freedom to add the most imaginative and appropriate colours to each song. Bosse Broberg can be heard on five of them, his horn sometimes tightly muted but in "I Didn't Know About You" (the name of the original melody being chosen as the title of this album - "Sentimental Lady") he offers us one of the most majestic open trumpet sounds one can hear today. It is pure, straight melody all the way and yet every note is played with awe-inspiring intensity as if in acknowledgement of the master-composer, Duke Ellington. Palle also shows a strong melodic sense in his solos and the supportive accompaniment to Agneta at the beginning and end of "Close Enough For Love". Gösta Rundqvist, who as one of the most sympathetic of pianists and accompanists is nevertheless always prepared to flex his muscles in moments requiring emphasis. Agneta points out that in the beautiful final number, "Where Do You Start? ", the piano introduction and ending reflect Gösta's love of wind-chimes, something that any visitor to his home will experience as an integral detail. There are many interesting things that strike one listening to this CD for the first time, small details that grow on each listening. They are too many to enumerate here but Agneta would like to point out that her reason for including "Young and Foolish" is her genuine love and respect for young people who don't exactly have it easy in this increasingly threatened world: "Everyone needs time to enjoy their youth and dare to take risks and be foolish now and then". Notice here how Agneta forms every word of the song with chrystal-clear enunciation, something she shares with the late-lamented Jeri Southern who they say was Miles Davis' favourite singer during the 'fifties. Speaking of Miles Davis, notice the coda of "My Ship" with its echo from the historic "Miles Ahead" album. Mel Tormé's "Born to be Blue" contains all the classic elements a singer requires to convey those lump-in-the-throat, ache-in-the-heart, tear-in-the-eye feelings (listen to the way Agneta interprets the line "when you left....the curtain fell"). But when Bosse Broberg enters with his optimistic trumpet solo it is as if he is saying - o.k. now let's overcome this mood and go start a revolution somewhere - it is the very assertion of life. It is contrasts such as these that make this CD such a listening pleasure. Whatever the material, Agneta Baumann captures "La melancolie d'amour", or what one writer (Andrew Simon, in a reference to torch songs) described so inventively as songs for "anyone who's ever been left standing at the bus stop of love". Agneta herself prefers to deepen that nuance to "the bus stop of life!" This album from the start was never intended to bear any kind of label concerning style or era. Anyone who has enjoyed the midnight moods spun by Lena Horne, Peggy Lee, Julie London, June Christy, Chris Connor and many equally great artists perhaps miss hearing that kind of song being interpreted today. Fortunately there are still some singers around who can affect us deeply, but it is an art that only a few have convincingly mastered by way of genuine feeling. Agneta Baumann is one of that few. "A smooth delivery as well as her own unique way of phrasing make Agneta Baumann one of the most respected Jazz singers in Sweden. Her trio on this outing is unique in that it is not your typical piano bass and drums setup but rather trumpet bass and piano. This arrangement lends itself beautifully to Baumann's style of singing." "An opportunity to listen to one of the finest trumpet players on the Swedish jazz scene, Broberg's ability is on display for all to enjoy." "Broberg's sympathetic solo flows like a slow running river before Baumann's return to the vocal." "Gösta Rundqvist offers some delicate yet effective piano playing that contributes to the spirit of this classic." "Danielsson's sparse bass playing is effective in that it lays the foundation for this fragile yet meaningful love song. His talent has been recognized for many years and on this number we hear why." "Making ballads her main vehicle for vocal expression, Baumann offers listeners a recording suited for late night listening, relaxing and romantic evenings. Her phrasing is second to none. Baumann's sense of enjoyment shines through on every number. This is one recording not to miss. Highly recommended."